The European Parliament at a plenary meeting in Strasbourg on Thursday adopted a resolution on Ukraine, which expresses support for Ukraine and condemns actions by Russia. The document welcomes the recent signature of the remaining part of the association and free trade agreement between the EU and Ukraine. MEPs also welcomed the decision by Brussels to begin immediately the provisional implementation of this document, and called for its speedy ratification. The European Parliament supports a peace plan by Ukrainian President Petro Poroshenko as "a major chance for de-escalation and peace." It also "supports President Poroshenko's decisive actions to guarantee the unity, sovereignty and territorial integrity of Ukraine." At the same time, the EP reiterates that Russia is involved in military action and supplies, and urges Russia to fulfill its international obligations, to genuinely commit to peaceful settlement negotiations and to use its real influence to stop any violence. MEPs also "reaffirm the right of Ukraine to self-defense," recalling that "the international community supports the unity, sovereignty and territorial integrity of Ukraine." They condemn "Russia's aggression on Crimea as a grave violation under international law of Ukrainian sovereignty and territorial integrity and reject the Russian policy of the fait accompli in foreign relations," consider the annexation of Crimea to be illegal and refuse to recognize Russian de facto rule on the peninsula, and welcome the EU's decision to prohibit the import of goods from Crimea and Sevastopol which do not have a Ukrainian certificate. While condemning the continuing bloodshed in eastern Ukraine, the European Parliament "welcomes the goodwill shown by the Ukrainian side in adopting a unilateral ceasefire and regrets the fact that the rebels and mercenaries refused to follow that example." The EP calls on Russia "to support the peace plan with true determination, to adopt measures to control its own border with Ukraine effectively and stop the continued incursion of illegal armed men and of arms and equipment, hostile action and infiltration, to immediately reduce and pull back its troops from its border with Ukraine, and to use its power over the rebels and mercenaries to force them to respect the ceasefire, lay down their weapons and withdraw back to Russia via a retreat corridor, as provided for in the Poroshenko peace plan, as the first long-awaited concrete steps to prove that Russia is serious about de-escalating the crisis." The EP deplores the illegal detention of Ukrainian air force navigator Nadia Savchenko in Russia and demands her immediate release, as well as the release of all hostages held in Ukraine or Russia. MEPs welcomed the extension of the current sanctions to a further 11 people and the "preparatory work undertaken by the Council, the EEAS and the Member States with a view to further sanctions against Russia, which should include the economic, financial and energy sectors, and an arms and dual-use technology embargo." 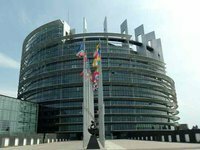 The EP also calls for "a collective ban on the sale of arms to Russia and urges its implementation until the situation in eastern Ukraine has normalized," warning that any further steps by Russia to destabilize Ukraine will lead to additional and far-reaching consequences for EU-Russian relations. MEPs demanded that the European Council call on Russia to fulfill its obligations under international law, and that it "apply the third phase of sanctions should the situation so require." The resolution "urges the European Council to adopt a more coherent and firmer strategy – and to speak with one voice – vis-a-vis the Ukrainian crisis and the behavior of the Russian government, including on matters related to EU energy security," and deplores the fact that "some Member States are showing disunity in this regard and a lack of EU solidarity." The EP strongly believes that the role of the OSCE Special Monitoring Mission should be strengthened, with increased material and financial means, "so as to support Ukraine in securing and monitoring the regions along its border." The EP also called for an independent and impartial investigation of all the deadly events and crimes against humanity that have taken place in all parts of Ukraine since November 2013, with the inclusion of a strong international component and under the supervision of the Council of Europe, and for those responsible to be brought to justice. The EP "recalls the necessity of ending the systematic and structural curtailment of human rights, the bad governance, the widespread corruption and the colossal shadow economy in Ukraine; stresses the importance of the ongoing process of constitutional reform," and "calls for the adoption of an anti-discrimination law in line with European standards." The EP considers that it is of the utmost importance to start a gradual process of decentralizing central powers to regional and municipal administrations "without undermining the internal balance of powers or the effective functioning of the state." Two paragraphs of the resolution are devoted to the problem of supply and transit of Russian gas. The European Parliament "underlines the necessity of finding a clear, fair and stable solution to ensure the security of gas supply from Russia to Ukraine," and believes that "the EU should continue to play its role in facilitating an agreement allowing Ukraine to pay a competitive price, which is not politically motivated, for its gas purchases." It also stresses that the use of energy resources as a foreign policy tool undermines the long-term credibility of Russia as a reliable trading partner for the EU and that further measures to lower the EU's dependency on Russian gas must be a priority. It drew attention to the fact that "the use of energy resources as a foreign policy tool undermines the long-term credibility of Russia as a reliable trading partner of the EU." MEPs called on the member states "to ensure sufficient gas supply through reverse gas flow from neighboring states in the EU." The EP welcomed the European Commission's creation of the Support Group for Ukraine, which will provide the Ukrainian authorities with all necessary assistance in undertaking political and economic reforms.